I have to confess that, when it comes to monitors, I've always been something of a late adopter. It's only a been a handful of years since I deserted my trusty old 17" CRT monitor – which might have been smaller but had the kind of response time that gamers so desperately seek. My LCD monitor was a little bigger, a little slower and a little easier to transport – and although I've occasionally wondered if I'd be better off with something bigger I've never been able to justify the costs. But after spending a little time with BenQ's V2400W LCD monitor I'm thinking of raiding the piggy bank and upgrading to something a little more, well, impressive. It's a stunning piece of kit – and judging from the coos around the office I'm not alone in thinking that the offset stand, maximum 6cm width and glossy surround make it an instant object of desire. Of course, the slightly over-prevalent HDMI and senseye+photo logos may not be to everybody's taste and a couple of people expressed an opinion that they would prefer the stand to be something other than aluminium effect. But, with the monitor up and running and the resolution cranked up to 1920 x 1200, this was a head-turner, even in an office shared with the gadget-obsessed T3 people. Of course, I wouldn't be quite as poetic about this as the overblown but amusing BenQ product page but who's to say that the beauty of movement hasn't been captured for me to enjoy? But moving swiftly on – the 24" of widescreen are certainly a boon for any info-junkie who insists on having multiple browsers (and with multiple tabs) on the go at once. This was a monitor built with watching video in mind, which makes it a little bemusing that the supplied connector was analogue VGA which doesn't take advantage of the V2400W's DVI and HDMI inputs. Buttons are unapologetically displayed at the bottom left of the monitor and, in my opinion, all the better for it – accessible, obvious and certainly not out of place or ugly. In terms of image quality, this is a panel that brings everything you would expect an LCD monitor to bring – those people who like working at extreme angles from their monitor (anyone?) might worry about the colour shift, and the colour isn't exactly accurate. For gamers the response time is given as 5ms – or 2 grey to grey – fairly rapid, although you'll need a fairly high end graphics card to take advantage of the highest resolutions – as you'd imagine. 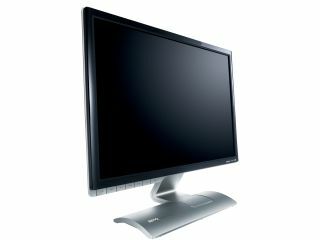 So, if you happen to have just shy of £330 sitting in your pocket and you're looking for a monitor you could do a lot worse than the BenQ v2400W LCD monitor – and you certainly won't get any complaints from the style conscious.